The perception that it's high in sugar has some people asking, "Is watermelon bad for you?" Your answer should center instead on the stellar nutritional content of this refreshing fruit. Watermelon is a good source of vitamins A and C, lycopene, potassium, and an amino acid called L-citrulline. As the temperature rises, you may be spending more time at barbecues, cookouts, and picnics. One way to cool off is to end your meal with some juicy slices of watermelon, but—as those who hear that it’s high in sugar might ask—is watermelon bad for you? 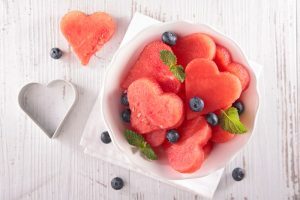 Not only is it portable, easy to serve, and capable of feeding many hungry people depending on its size, watermelon is packed with nutrition at only 46 calories per cup. 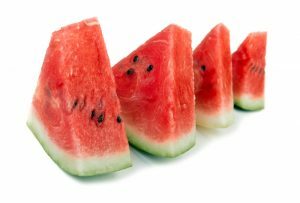 One reason watermelon is such a great summer fruit is that it’s composed primarily of water—between 90 and 92 percent. Its high water content helps you stay hydrated, which is important when you’re spending time outside in the heat. Is watermelon bad for you? The real question is: How good is watermelon for you? It’s a worthy source of vitamins A and C, lycopene, potassium, and the amino acid L-citrulline. If you’re still asking the question, “Is watermelon bad for you?” the proof is in the fruit’s nutrients. 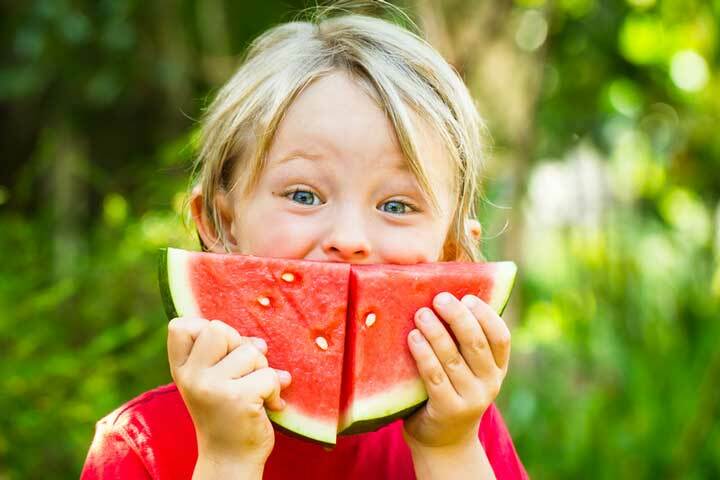 Watermelon is a good source of vitamins A and C, lycopene, potassium, and an amino acid called L-citrulline. Vitamin A plays an important role in vision, as well as supporting optimal function of the immune system, heart, lungs, and kidneys. Vitamin C is important for maintaining healthy skin and gums as well as a strong immune system. Lycopene is believed to help protect against cancer, especially prostate cancer, and is an antioxidant that may help protect cells from the damaging effects of free radicals. 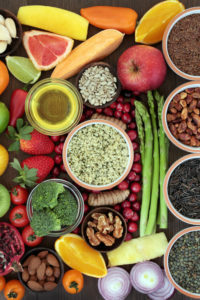 Potassium helps lower blood pressure by regulating the level of sodium in your bloodstream and increasing the amount of fluid your body eliminates. Potassium also plays a role in breaking down carbohydrates and supports healthy muscle and digestive function. L-citrulline has been shown to improve circulation, relax and dilate blood vessels, and lower blood pressure. One of the best uses for watermelon is as the basis for a refreshing fruit salad, in which you can complement it with blueberries along with strawberries, grapes, melon, kiwi, and more. When choosing a watermelon, select one that’s heavy and sounds hollow when tapped. Stay away from ones that are bruised, and go for ones that mostly symmetrical. Also look for a yellow spot on one side; called a “field spot,” it shows that a melon sat in a field, ripening in the sun. A white spot or no spot indicates that the melon is underripe. Many people discard the rind and seeds, but the entire watermelon is edible. The rind of the watermelon actually has more L-citrulline than the red, fleshy part. According to the Watermelon Board, you can pickle, juice, or even shred the watermelon rind and use it in cole slaw. The watermelon seeds can also be eaten; drizzle them with a little olive oil and a sprinkle of salt or cinnamon and roast them in the oven for a crunchy snack. Watermelon seeds are high in iron, magnesium, protein, and zinc. Make watermelon popsicles or ice cubes from pureed watermelon. For a fresh take on salsa, combine diced watermelon with pineapple, onion, lemon or lime juice, and jalapenos and serve over grilled fish or chicken. Create a tasty, thirst-quenching beverage by blending watermelon with berries or other summer fruits. Make a refreshing salad with watermelon, cucumbers, feta, mint, and lime juice. For more on the versatility of watermelon, visit 6 Uses For Your Watermelon Plant’s Bounty, posted by our friends at Countryside Network. The article includes DIY tips on watermelon lemonade, watermelon ice pops, watermelon jam, and more. antioxidant, blood pressure, calories, cancer, digestive, free radicals, immune system, iron, is watermelon bad for you, lower blood pressure, lycopene, magnesium, muscle, nutrients, nutrition, potassium, Prostate, prostate cancer, protein, skin, sugar, vitamin, vitamin a, vitamin c, vitamins, zinc. its also recommended to keep one hydrated.